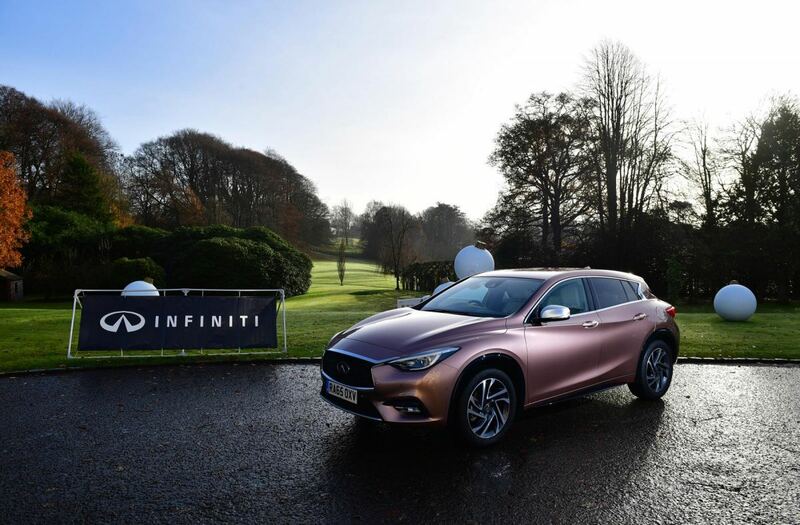 We reported a short time ago that Infiniti Cars now has a base on Belfast’s Boucher Road in the capable hands of Mervyn Stewart Ltd and since then we got invited to view and review most of the line up on local roads. The Infiniti brand is one that has been around since the late eighties and is massive in the United States of America. Infiniti is to Nissan what Lexus is to Toyota for ease of explanation, a brand within a large group that offers premium, luxury cars with performance and agility. 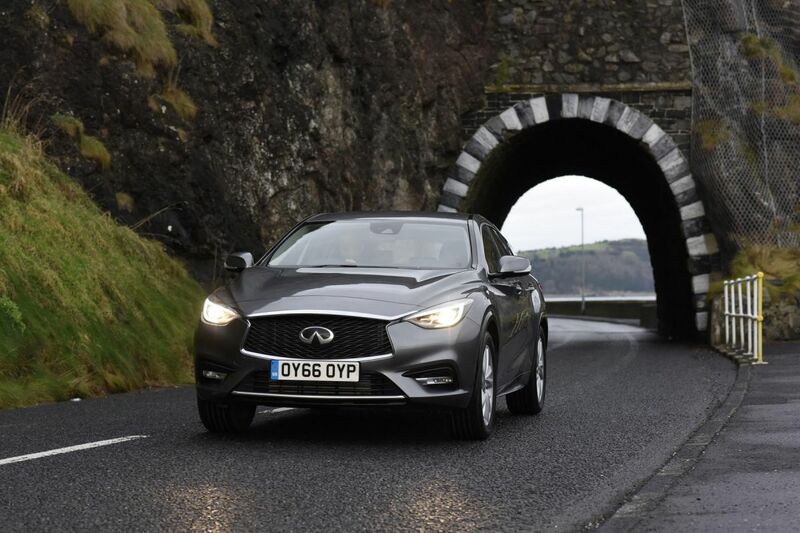 The Q30 is the baby of the Infiniti range and thanks to Infiniti UK we got a good feel for the Q30 on the meandering and undulating roads around the Galgorm Resport & Spa just a couple of weeks ago. Signature styling from Infiniti that is incorporated across the range includes the large open front grill, the dramatic creases and lines along the side of the cars as well as the sleek headlamps which house LED daytime running lamps. 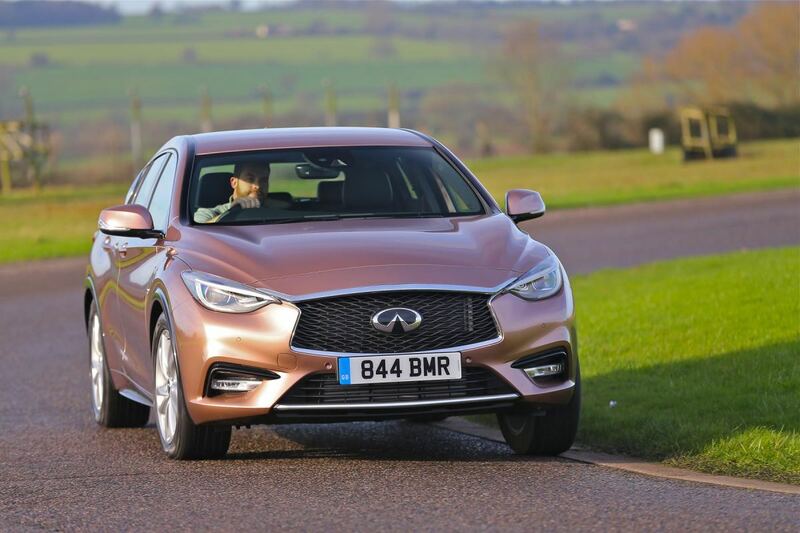 The Q30 range starts from just over £20k with the base model SE and goes via the Premium model and Premium Tech model to the Sport model which starts at just shy of £26k with a mass of options and trim levels available on each one. This model tested is an SE with a good few options ticked, the main one being the ‘Business Pack’ which comes in at £2,270 and if you happen up (BP) during the article then you will know that whatever feature mentioned just before, is part of said pack. 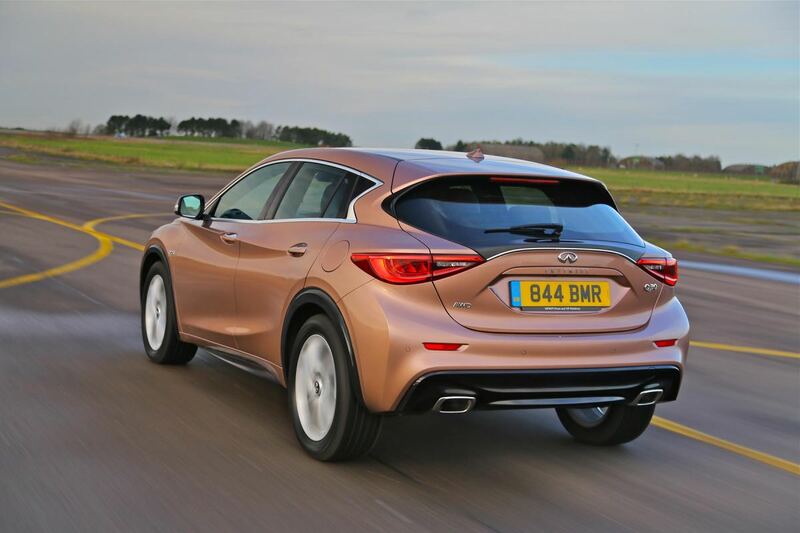 At a glance the Q30 is a car that could be confused for a crossover with its black arch mouldings, however it is not a crossover as that is what the Infiniti QX30 was built for (a lifted up all wheel drive variant of the Q30 that I will talk about in another review in the coming weeks). 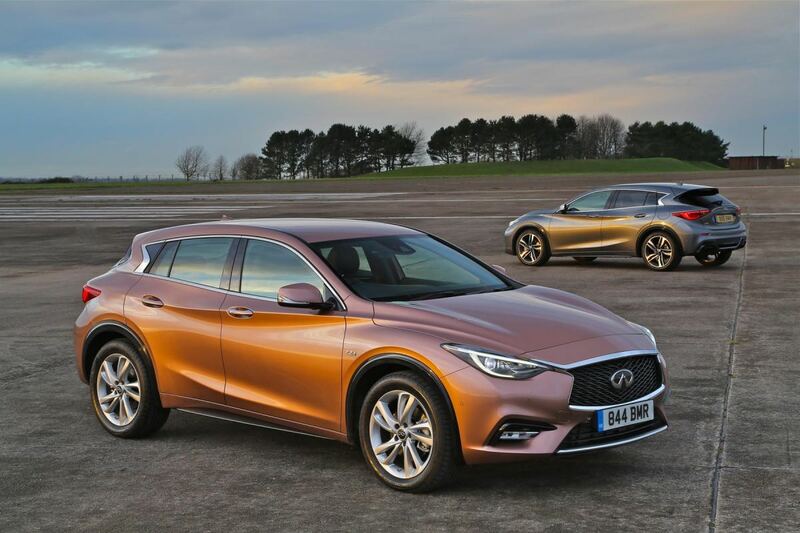 The Q30 falls into the segment that puts it against the likes of the Volvo V40 or the Merc A Class and the Infiniti most certainly brings a lot more style and ‘look at me’ to the class with its daring design. The previously mentioned arch trims are finished in gloss black and 18” alloy wheels on the model tested aided the aesthetics of the Q30 with front LED fog lamps, rear LED lighting and automatic front lights. Front and rear parking sensors ease the pressures when at the shops or in a busy town with heated washer jets and heated, electrically folding mirrors adding to the premium feel and safety of this Infiniti. Load space was surprising and being a hatchback, with the rear seats folded flat offers fantastic room for larger loads when required. A pair of Labradors would fit comfortably or a few sports bags when on designated driver duties to a Saturday game. 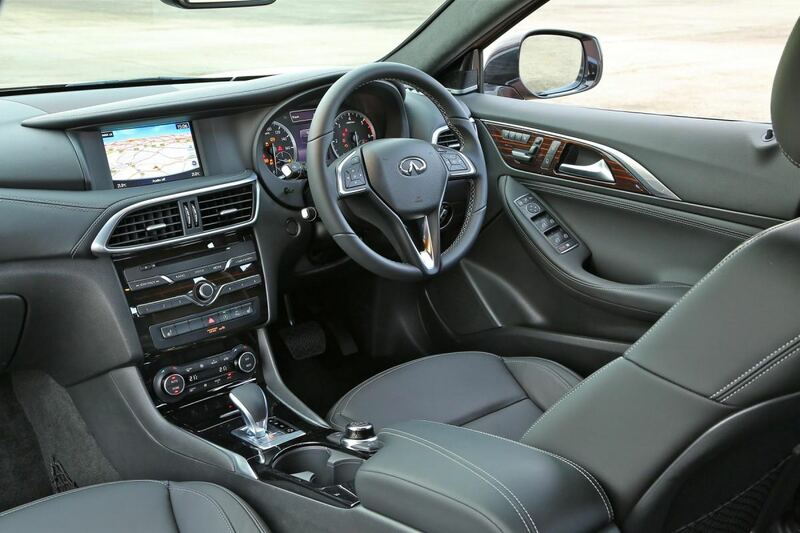 Inside the Q30 is a very nice place to be, finished well and most importantly finished in quality materials, or at least materials that look and feel quality with average room for rear passengers and more than ample room in the front of the cabin. The seats offer good support and comfort was in abundance, it is sometimes hard to get a seat that is comfortably soft yet has the support required so well done on that one Infiniti . Front seats on the model tested were heated (BP) while dual climate control, cruise control, auto dim rear view and drivers mirror along with electric lumbar support are all added as part of the (BP). ISOFIX rear child seat anchor points mean that the Q30 has young families in mind and to be fair it would be a very practical family car alongside say a Q60S in the drive that would offer the executive coupe experience along with spirited jaunt to the shops while the Q30 can handle the full family duties. Infotainment is in abundance via a 7” screen in the dash with steering wheel controls, drive wheel controls on the centre console and voice control. On offer is CD playback, 2x USB inputs which will connect a compatible smart phone or iPod. BlueTooth comes as standard whilst Sat Nav and DAB Radio on this model are added thanks to the BP. The system was simple and easy to use and I always prefer using the touch screen rather than the drive wheel but I guess voice control is always the safest option. 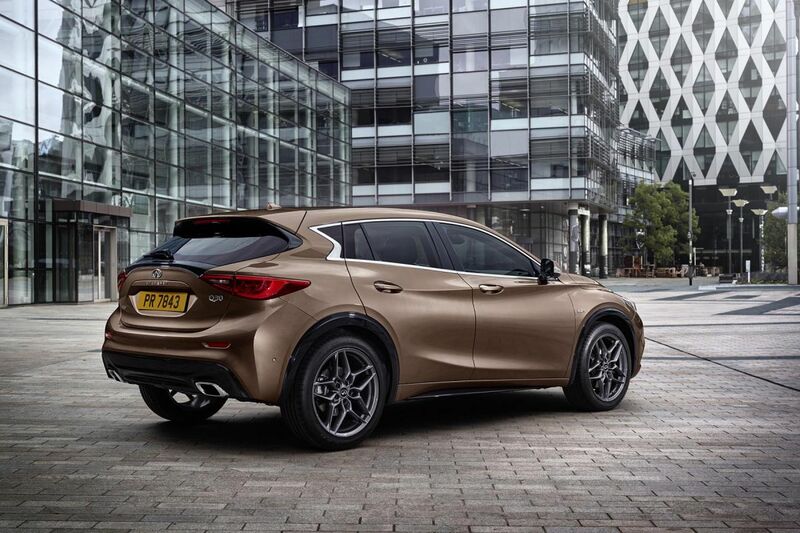 Engine wise the Infiniti Q30 offers varying options which I will touch on briefly. A 1.5 diesel (109PS) can be chosen in manual or automatic with a 2.2 diesel (170PS) coming only in auto with the option of front or four wheel drive. Petrol wise there is a 1.6t (122PS) manual along with a higher output of the same engine (156PS) coming with the automatic ‘box with the range topper being a 2.0t producing 211PS coming only in auto with either front or four wheel drive. 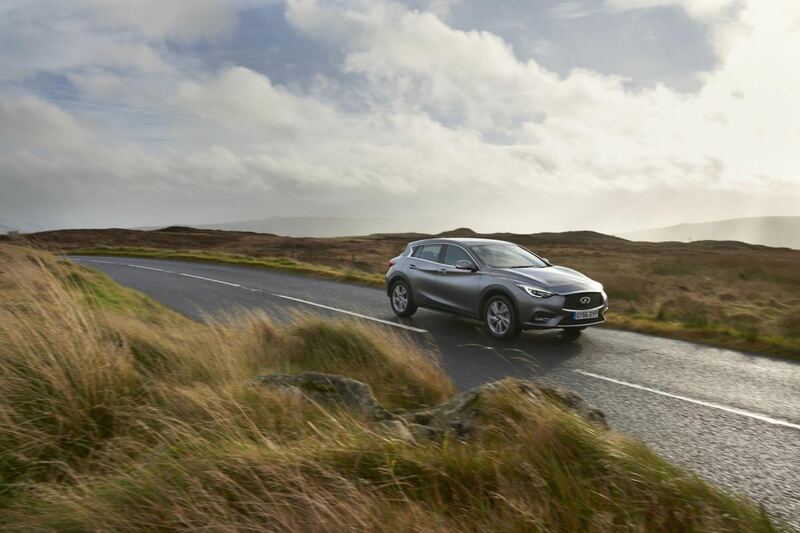 The model tested was fitted with the 1.6t 156PS engine producing 250Nm of torque and alongside the 7 speed DCT Auto ‘box was a pleasantly capable combination with a 0-60 in just 8/.9 seconds that absolutely loved the Co. Antrim countryside. Variable gearbox settings were explored and for daily driving and commuting ‘eco’ mode would suffice whilst ‘manual’ mode via the paddles isn’t something that many owners will use much as the ‘sport’ mode is fantastic. 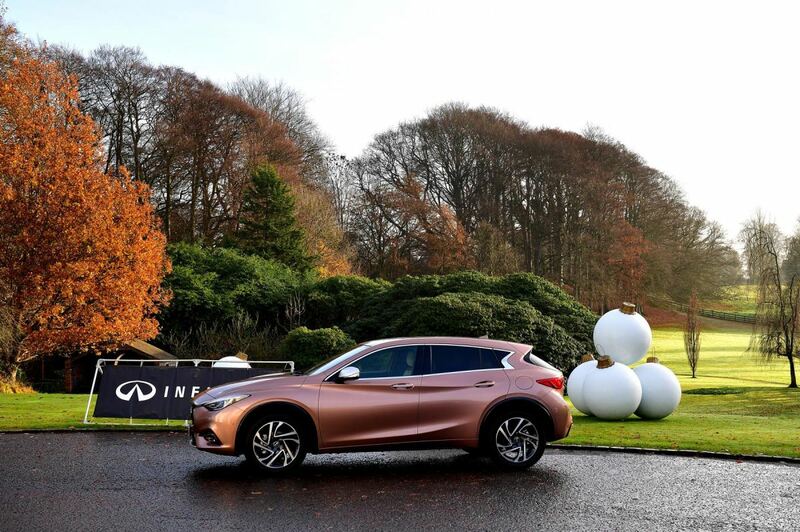 The Infiniti Q30 is very sure footed when on a spirited run and for a small, practical hatchback actually was a drive to remember as the 1.6t engine with ‘box in sport mode was just the perfect combination for enjoyment whilst on the road I did note wind and road noise that was more audible than any of the other models tested from Infiniti . 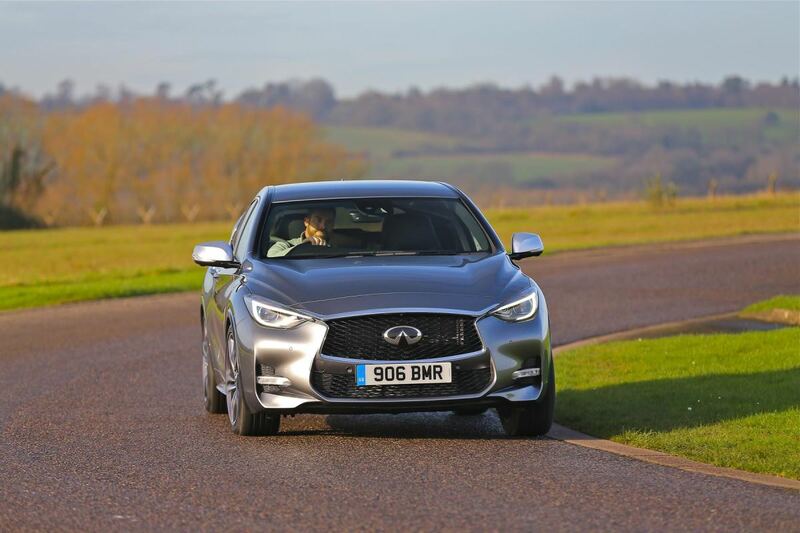 Infiniti were the first to introduce semi-autonomous technology such as lane departure warning, blind spot warning and forward collision warning and stop and on that basis the full range is well equipped with safety and driver aids. This model tested has hill start assist, adaptive brake assist, forward collision and warning technology alongside auto wipers and lane depart which come as part of the BP. Annual road tax on the 1.6t auto comes in at a mere £130 with a claimed, combined mpg of 48 which is impressive. All in all first impressions overall are very positive with the Infiniti Q30 as well as the others in the range that I drove so keep your eyes on the blog for those reviews and in the meantime get down to Mervyn Stewart in Belfast’s Boucher area for a look and learn more about the options and technology available. A-Class Merc with a different coat on!